What is it about people, especially those with families and little kids, that once they figure out their brand new mansion that their rich uncle left them is actually haunted by malevolent ghosts, that they don’t move out as soon as the first meat cleaver goes whizzing past their heads? Is it because they couldn’t get a U-Haul rented on such short notice or what? 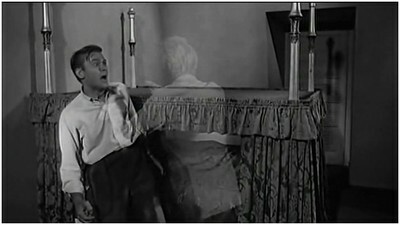 William Castle (The Tingler) works overtime explaining why a seemingly regular family would spend an hour inside a house with several ghosts, let alone three days, but in the end he relies on one of the gimmicks (Illusion-O) he was famous for to distract the audience from the grade school level chills the film barely generated. Most of us who weren’t around for these movies when they were theatrically released won’t ever get to experience these stunts, so much of their supposed charm is lost on the video generation. 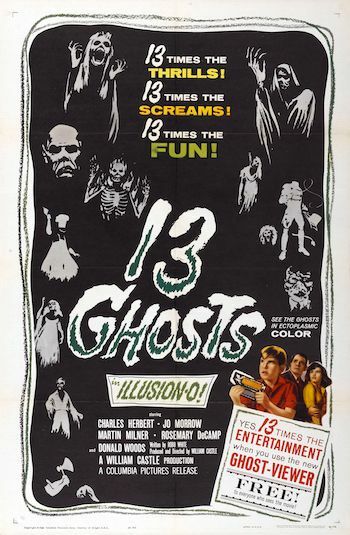 Columbia’s release of 13 Ghosts tries to remedy that by actually including a “ghost viewer” in the packaging along with two versions of the film, one with Illusion-O and one without. The ghost viewer is set up with a red filter which allows you to see the ghosts in certain scenes and also has a blue filter right below that, which you could look through if you didn’t want to see the ghosts. It rapidly wears thin once the sequences with the ghosts drag on and your arm gets tired of holding the thing up to your face like some kind of white trash opera glasses. So how does the Zorba family end up in this haunted house? The father, Cyrus Zorba, is a nice guy who works at a museum, but is completely inept in providing for his family which includes the nagging wife Hilda, the sexpot daughter Medea, and the rambunctious All-American squirt Buck. One night Buck is having his birthday dinner with his family on the floor (the furniture had been repoed) and he makes a birthday wish for a house with furniture! A mysterious wind blows in and extinguishes the candles. Then a telegram arrives and it tells Cyrus to meet a lawyer downtown the next day. The next day, Cyrus and Hilda meet up with lawyer Ben Rush. 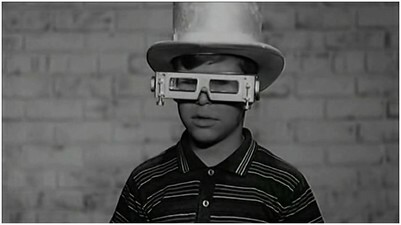 This young, smooth talker tells Cyrus that his uncle croaked last month and left him his haunted house complete with 12 ghosts and super-deluxe ghost goggles. Cyrus and Hilda know a good deal when they hear one and immediately move their family into the rambling mansion. Cyrus finds a book written in Latin that he has his buddy at the museum translate. It’s his uncle’s journal about all these ghosts he caught around the world and brought back to the house. He caught eleven ghosts, the uncle was the twelfth, and there’s a ghost to be named later. 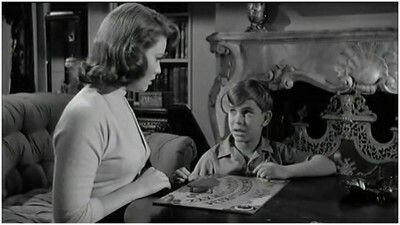 The family periodically encounters the ghosts and then Castle switches over to a Scooby-Doo plot about the missing money that the uncle had stashed somewhere in the house. I groaned, fogging up my ghost viewer, as soon as I saw this. I immediately knew that the young, smooth-talking lawyer was obviously the one that killed the uncle and was now after his money. Wasn’t there a lawyer bad guy in Castle’s The Night Walker? Give it a rest already! Ben does the usual things like urging the family to move out of the house ASAP, dressing up like the uncle’s ghost and scaring Medea, and trying to murder Buck with a killer bed. Killer bed? Yeah, it’s one of those canopy deals and its top comes down real slow to squash you. I was never sure how it would ever have enough power to actually crush anyone, but it ended up doing the job to Ben thanks to the uncle’s ghost! This is probably the best possible movie you could have made from an idea you got during an eye exam. This is supposedly how Castle came up with Illusion-O and then he had a story constructed around it. The result is a movie where the ghosts don’t have much to do with anything except at the very end and then only the ghost of the uncle actually partakes in the plot. I never understood this family either. Sometimes they were really scared and Hilda was demanding to move out and then the next morning she’d be in the kitchen making breakfast and asking Cyrus and if he woke Buck up for his Eggos yet. No one seemed overly concerned about the various threats made to Medea and Cyrus didn’t even seem put out when he saw some ghosts and ended up with a big “13” burned into his hand. If the Zorbas don’t care too much about their plight, why should I?